If you missed all of the fun live, Apple has just posted the complete video of Thursday’s iPad-centric media event. 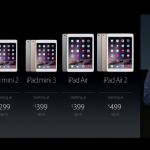 During the keynote, Apple unveiled the iPad Air 2, iPad mini 3, the first iMac with a Retina 5K display, and more. For some highlights from the event, see: Let’s take a look inside Apple’s brand new iMac with Retina display, Apple’s iPad Air 2 will ditch the classic side switch, but not iPad mini 3, Apple’s iOS 8.1, with Apple Pay and iCloud Photo Library beta, will arrive Monday.